Olyana GrodThe Ukrainian Canadian Congress is pleased to present the Ukrainian Canadian Youth Leadership Award to Olyana Grod of Mississauga for her work in positions of increasing responsibility and leadership in Ukrainian Youth Association CYM, including being the current national president. In addition to being instrumental in organizing the 2010 CYM World Jamboree, Olyana has been actively involved in the community, having organized Holodomor Education Week and Ukrainian Independence Day celebrations at Queen’s Park. She has served on the executive of SUSK and has currently begun an internship with the Canadian Urban Institute in Kyiv. 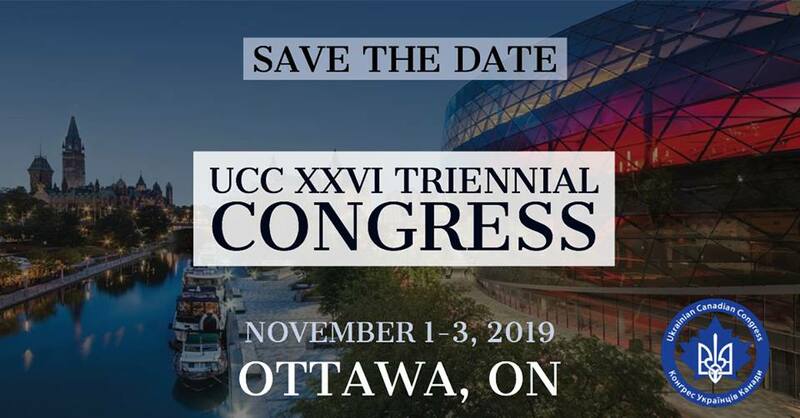 Adriana LuhovyThe Ukrainian Canadian Congress is pleased to present the Ukrainian Canadian Youth Leadership Award to Adriana Luhovy of Montreal for her work with PLAST, SUSK, Help us Help the Children, and with McGill and Concordia Ukrainian students unions. In addition, she successfully organized a charitable fundraiser for Ukrainian orphanages and was the main videographer for the documentary film on the Holodomor, “Genocide Revealed”. Andrijko SemaniukThe Ukrainian Canadian Congress is pleased to present the Ukrainian Canadian Youth Leadership Award to Andrijko Semaniuk of Winnipeg. Andrijko has been active in the Ukrainian Youth group CYM and sits on their national executive. A business student at the University of Manitoba, Andrijko is also a member of the musical troupe Zrada which has travelled across Canada and the US as well as performs with the Hoosli male chorus. He is active in the Catholic community, having served as an altar boy and member of the choir at Sts. Vladimir and Olga Cathedral. 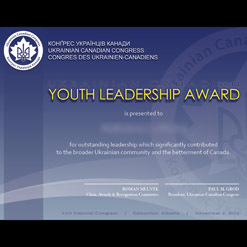 Roman StoroshchukThe Ukrainian Canadian Congress is pleased to present the Ukrainian Canadian Youth Leadership Award to Roman Storoshchuk of Alberta. Roman is currently studying Philosophy at the University of Calgary. He is also vice-president of the University of Calgary Ukrainian Student’s Society. Roman is also actively involved with the Ukrainian Canadian Student’s Union (SUSK). Roman has been profoundly involved in Plast – Ukrainian Youth Scouting Organization, where Roman is a councillor for both the younger and older youth. Roman has been involved with the Ukrainian Canadian Professional and Business Association of Calgary, The Ukrainian Canadian Civil Liberties Foundation and the Calgary Ukrainian Festival.